It’s Teaser Tuesday! 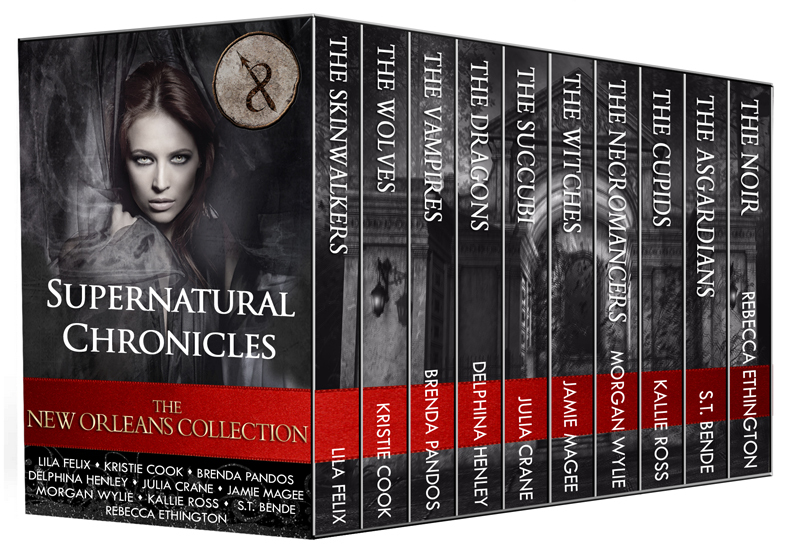 If you haven’t read Supernatural Chronicles: The Wolves, or any of the other stories in the series, now’s the time to get them all. The bundled collection releases Monday, Jan. 25, and in it is a second Scavenger Hunt with another iPad Mini up for grabs, as well as a way to vote for what comes next in the Supernatural Chronicles. Here’s a tease from The Wolves with a hint. Can you guess what it is? Five minutes later, I’d selected my six and Trevor his four, and after changing into old clothes—a necessary preparation for a hunt in case we had to shift—we gathered at our motorcycles. Following the Daemoni stench, we took a thirty-minute ride to Savannah. Not surprising, since the city was home to the nearest Daemoni cluster. We parked on the outskirts and followed our noses on foot. My body twitched with the desire to shift, knowing it could better protect itself in wolf form. Unfortunately, the Norman residents and tourists of Savannah might freak out at the sight of a dozen oversized wolves roaming the city streets. Gray had suggested before we left to ask the Amadis for help—a mage could shield and cloak us so the Daemoni wouldn’t see us coming—but I wasn’t about to do so. Char had said this was on us, and we didn’t need the Amadis in our business. As far as I was concerned, we didn’t need them period. We could take care of ourselves. We were a pack of werewolves, for crying out loud. “There’s a time for everything, including asking the Amadis for help,” Trevor murmured quietly as we slunk along the dark streets, following the scent. How did he always seem to know what I was thinking? Before I could respond, everyone suddenly paused. The Daemoni vampire we’d been hunting blurred across our path. Several low growls sounded before we took off, sprinting after the culprit. My fingers ached as my claws extended, and my skin stretched over my enlarging hands as they took on the shape of a wolf’s paws. My wolf inside struggled to break free, and it took everything I had to hold her back, especially when we trapped the vampire in a circle. Everyone surrounding him had begun the shift, claws and fangs extended and yellow eyes shining. “I don’t have it! It was already gone!” He spun, his hands held up. Although his eyes glowed red, fear also shone in them as they pleaded with us to have mercy. Which meant he was alone. Perfect. I almost wished now that we could exact our revenge and ambush him like they’d done to Daddy; wished that we weren’t part of the Amadis, who would always show mercy.